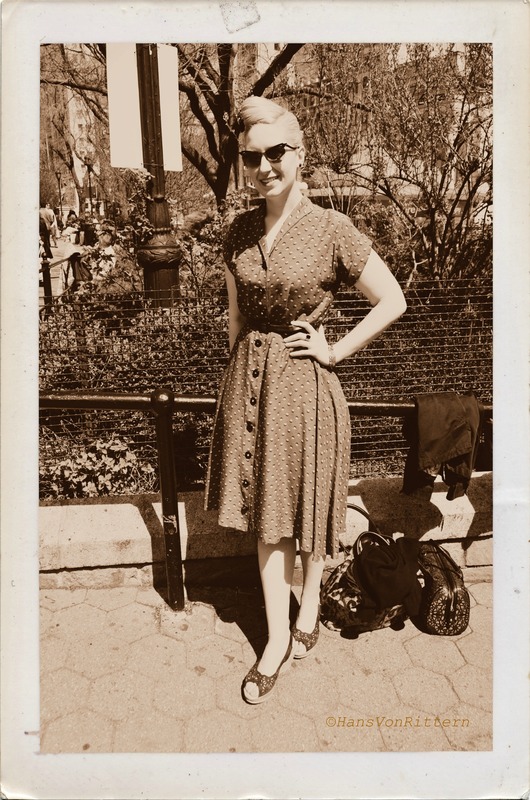 XENA, IMPECCABLE NEW YORK STYLE: There is self expression. There is a sense of fashion. There is a sense of style. Xena has perfected all three of them. I was photographing the people in Union Square, and it was the usual assemblage of punk rockers, NYU students, locals and 9-5ers. I was preparing to leave when I saw Xena leaning against the black cast iron railing and I stopped dead in my tracks. She was perfection! 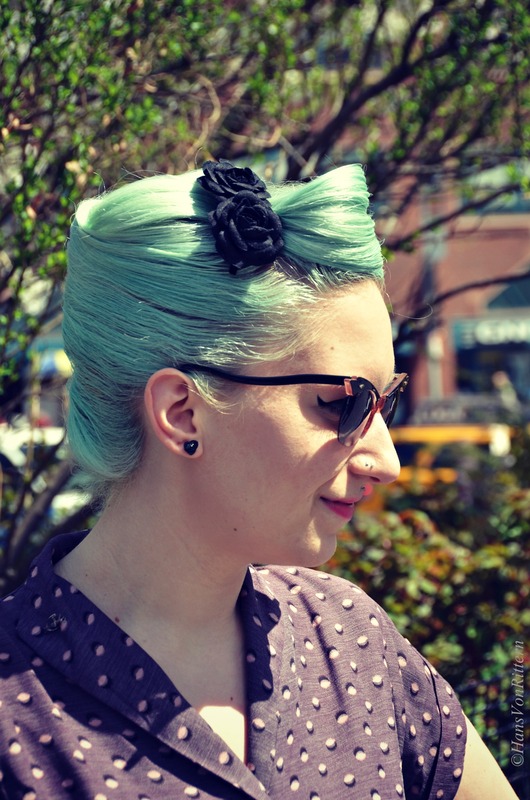 The jadeite green French twist hair contrasting with the faded violet colored dress showed off her beautiful alabaster skin, cat eye makeup and glasses to match. Retro, punk, chic all in one – done with style. Xena is New York ! Incredibly and sadly, there is nothing there on the spot to commemorate that sizzling moment, but the photos from that infamous scene will live on forever – you think of Marilyn – you think of that white Travilla halter dress which Debbie Reynolds recently sold at auction for $4.6 million dollars. 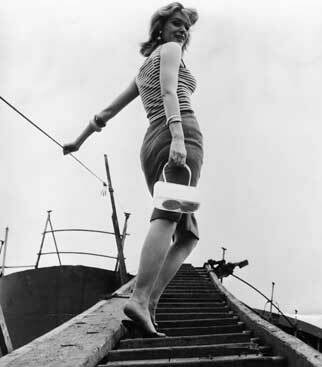 One the most perfect photographs was shot by photographer, her friend and film maker Sam Shaw. 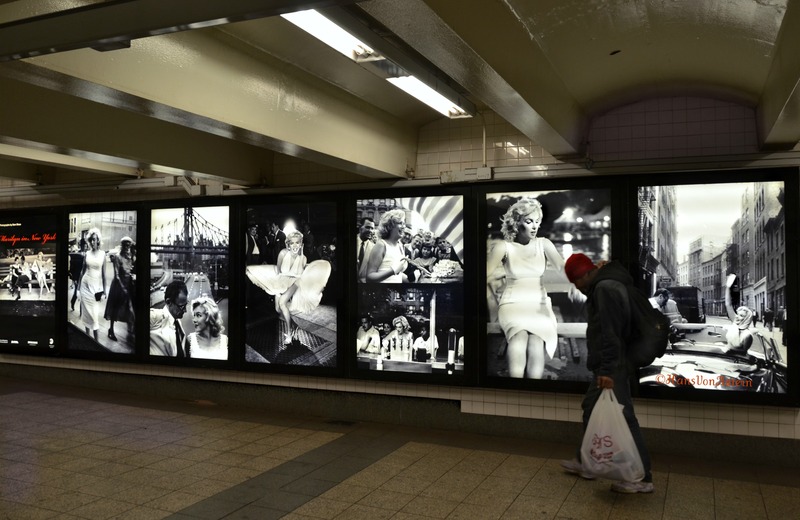 Thanks to the MTA’s Art for Transit Program you can now ‘bump into Marilyn’ again for all of this 2013 in our subway system. The supersized version of Sam Shaw’s well-known 1954 photo is part of an exhibit. The exhibit also features seven of Shaw’s other Monroe photos. Later, in 1957, he spent a day with Marilyn wandering around Manhattan, taking photos in Central Park – at a bench and rowing a boat, window shopping along Fifth Avenue and perched above the FDR with then husband #3 playwright Arthur Miller . PhotoS of the day: I AM FEATURED IN THE NEW ‘SocialEyesNYC.com’ VIDEO! PhotoS of the day: I AM FEATURED IN THE NEW ‘SocialEyesNYC.com’ VIDEO! 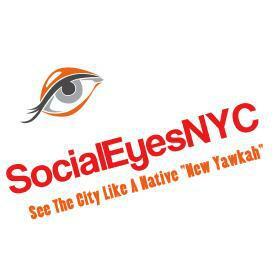 – My friend Randi Horwitz has a web site and Facebook page called SocialEyesNYC.com. Her current video release advertising her new site features some of my photos! The site features some of my photos and we will work together to feature more of my photos in the future. 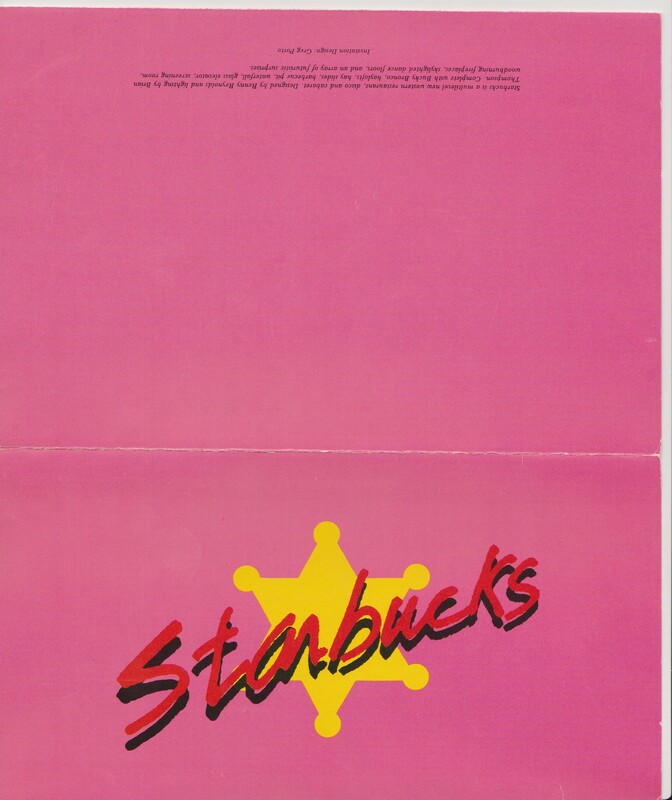 Mondays on Memory Lane – STARBUCKS USED TO BE A NEW YORK DISCO! 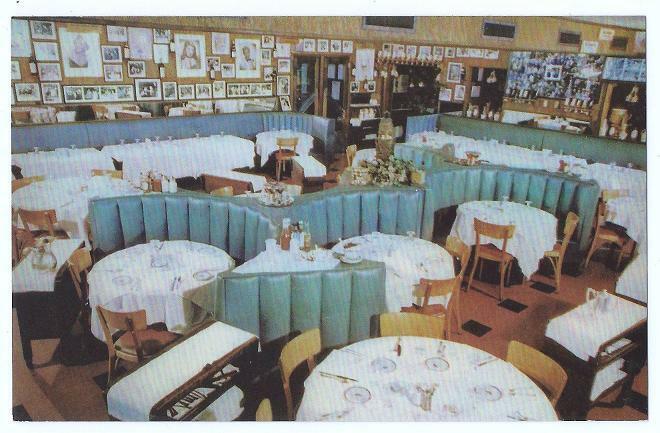 Mondays on Memory Lane – STARBUCKS USED TO BE A NEW YORK DISCO! – At the height of the disco craze, when there was a disco every few blocks in New York City, themes became the thing to separate a club from the crowd. There were circuses, mermaids, big band swing orchestras, human pin ball fists, ice skating, drag, dancing water fountains, roller skating featured in places such as planetariums, warehouses, garages, factories and even a deserted subway station. 1. Invite the gays and hope it turns into another Studio 54. 2. The straight chic crowd discovers it from their gay friends. 3. The gays leave because it isn’t “in” anymore. 4. The ‘bridge and tunnel crowd’ arrives aka Brooklyn, Bronx, Queens, Staten Island and (god forbid) ‘Jersey’. 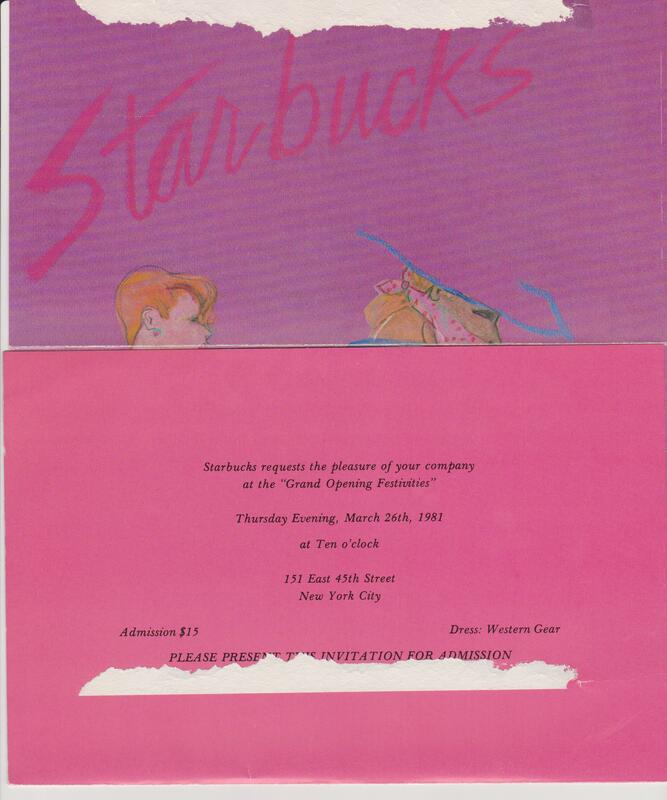 On Thursday evening, March 26th, 1981, in a (then) deserted section of the city, at 151 East 45th Street between Lexington and Third Avenues – STARBUCKS Disco opened with great fanfare. In order to attract a gay crowd while not wanting to put off and also attract the straight crowd from the beginning, a theme was needed, so rather than leather, glitz or drag – a cowboy theme was chosen, hopefully equally appealing to both gay and straight. Opening night was a mad house. The location itself used to be Danny’s Hideaway bar and restaurant containing four floors where newspapermen, cartoonists and magazine editors used to hang out. The new renovation turned the space into a multi-leveled disco with an identity crisis. There was a working fireplace which remained from the old bar still on the first floor. Since they were desperate to attract all crowds, there was a different atmosphere and music on four floors. A slide connected the floors so that you could fly down the chutes from floor to floor. 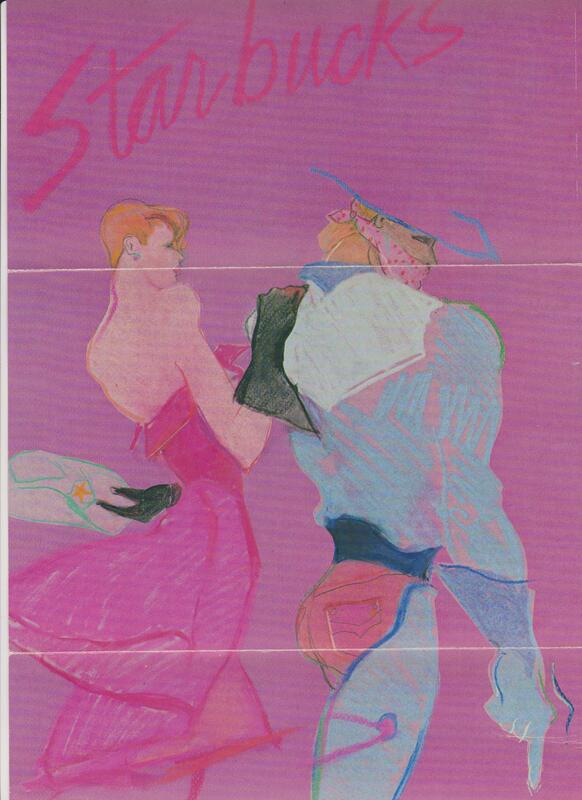 There was a dance floor on every floor—two of which were disco (one of the dance floors was lighted from underneath ala ‘Saturday Night Fever’), one rock and the top floor was country western complete with a mechanical bull! There was DJ Jim Maxwell on the first floor and DJ Dan (pooch) Pucciarelli on the third floor. With no Studio 54 elitist door policy in place, they pretty much let anybody in since they needed to fill such a big space. $15 got you in the door with free drinks all night…yes, free drinks served in tiny plastic cups which completely littered the floor. It was also one of the very few discos that advertised on local TV stations. What doesn’t work is to mix cowboy boot wearing, plaid shirted country music lovers with platform shoed, bell-bottomed glittery disco dancers and leather clad rockers. It was a disaster. Each floor’s music blasted the music so loud that it thumped through your chest. Imagine hearing Donna Summer, Duran Duran and Alabama blasting in one building at the same time – insane! The gays/chic Manhattan crowd wrote off the club opening night and the disco life cycle was rapidly overnight sped up to step #4 – ‘bridge & tunnel’. 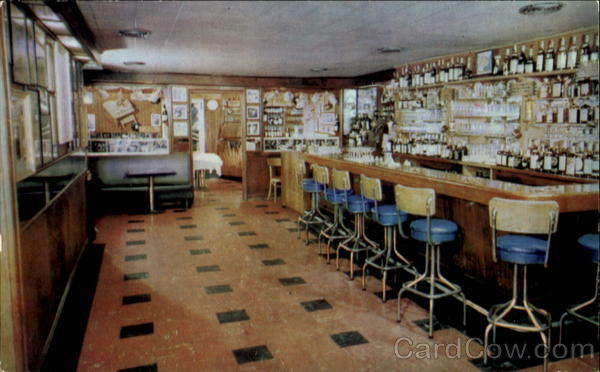 Eventually it turned into an after work hangout for the working class and weekends it was dead. The disco/dance crowd wanted to get dressed up and shine on the weekends, not mix with the working stiffs they were trying not to be, inevitably by 1984 Starbucks Disco closed. Today the name Starbucks is synonymous with the world wide caffeine giant it has become with over 20,891+ locations world wide, 13,280+ in the USA and 172 locations in Manhattan…so necessary for their public bathrooms we have come to seek out. 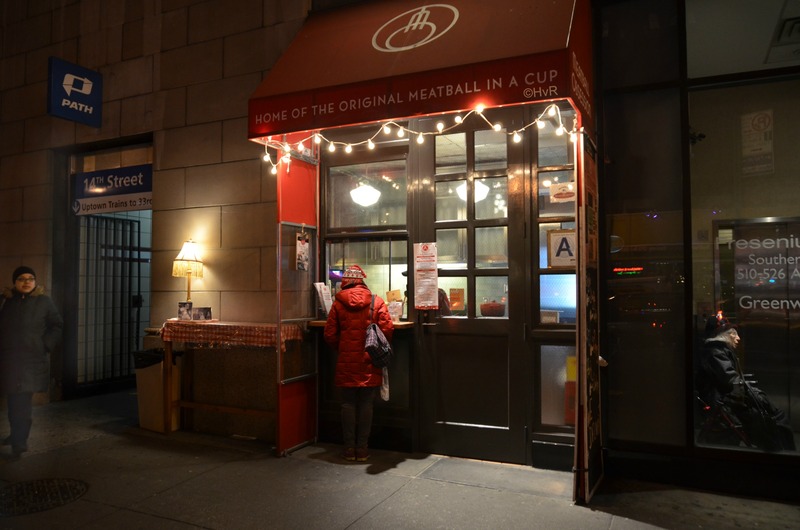 LATE NIGHT ON SIXTH AVENUE: It’s 11pm on Sixth Avenue in Greenwich Village. Three women are waiting. One for the bus. One for her meatball. One for…someone. “Hey dum-dum. 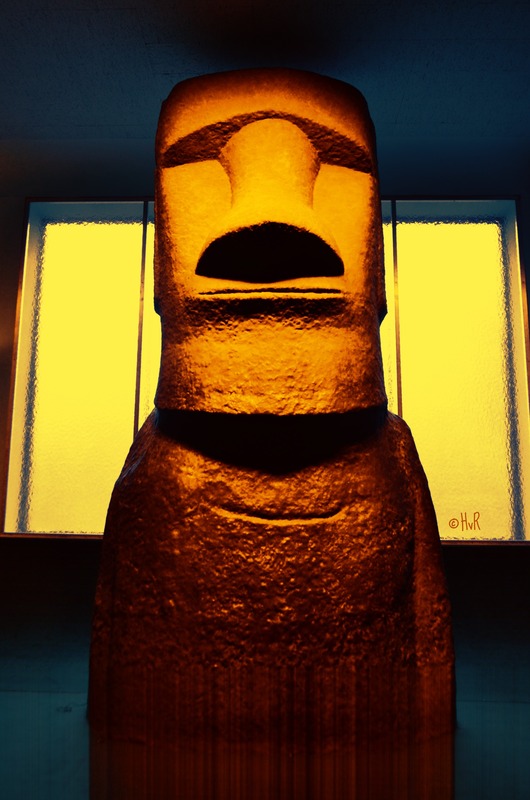 You give me gum-gum!”: One of the most beloved attractions at The Museum of Natural History is “Dum Dum” the talking Easter Island tiki statue from the 2006 movie “A Night At The Museum” starring Ben Stiller. ‘Dum Dum’ is actually a Moai carved by the Rapa Nui people from rock on the Chilean Polynesian island of Easter Island between the years 1250 and 1500AD. Nearly half are still at Rana Raraku, the main moai quarry, but hundreds were transported from there and set on stone platforms called ahu around the island’s perimeter. Eleven of the 887 statues have been given to museums around the world and have become well loved, especially ‘Dum Dum’. Easter Island Head: Hey! Dum-dum! Easter Island Head: You give me gum-gum! Larry: I give you gum-gum? Easter Island Head: You new Dum-dum. You give me gum-gum. Larry: Gee, okay, you know what? I have no gum-gum. Sorry. And my name isn’t Dum-dum. My name’s Larry. Easter Island Head: See you later, Dum-dum! Larry: [on his second night at the museum] Morning, dum-dum. Easter Island Head: Me no dum-dum. You dum-dum. You bring me gum-gum? Larry: Lots and lots of gum-gum. Easter Island Head: My dum-dum want to speak. 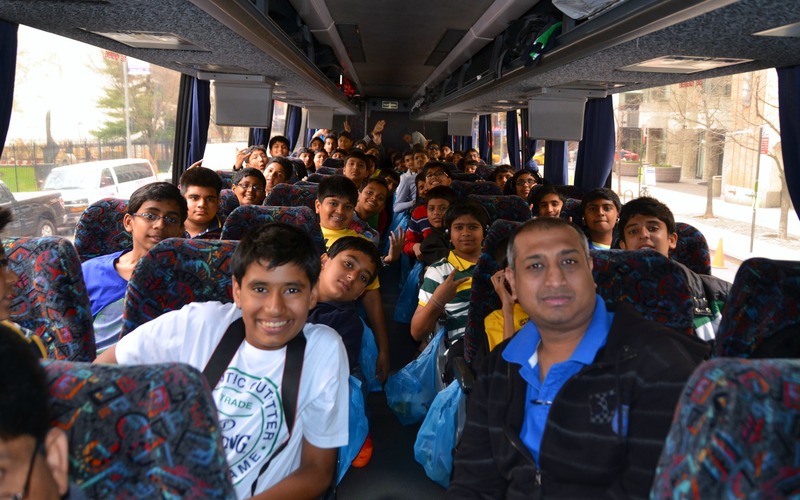 Photo of the day: MEET 59 OF MY NEWEST FRIENDS FROM INDIA! MEET 59 OF MY NEWEST FRIENDS FROM INDIA! – Three years ago my friend Ajay Bansal took one of my NYC tours while I was working for a horrible private touring company which wasn’t very “receptive” to their guests. Ajay left that company and came to me privately to lead his student tours through New York and it has been a joyful relationship ever since. 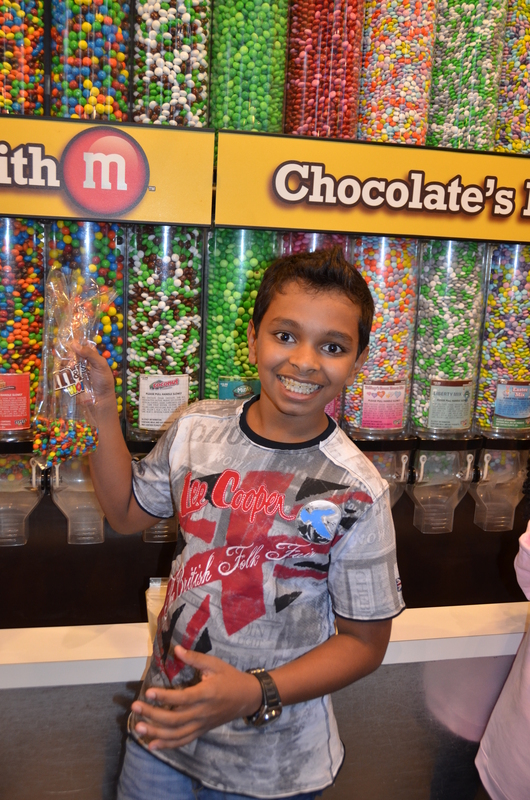 This spring 2013 tour was comprised of 52 gifted students (all boys) and 7 chaperones. Their eyes were filled with wonderment and eager with anticipation, hanging on my every word. As with most children abroad, their only concept of America and New York is through movies, videos and commercials. Their naïveté is adorable – upon seeing the Empire State building the youngest ones asked “Ooooh, is that the World Trade Center?” “Where is the Liberty Statue? !” “Can you see movie stars on the street?” “Have you met the president?” “Do you live in a penthouse?” I simply fell in love with all of them. The age range was from 13 to 18, so the group ranged from total innocence to hip hop wanna-bees. But one thing they all have in common is a stringent politeness. It took me a whole day to stop them from calling me “sir’ and we finally settled on “Mr. Hans”. “What are all those white boxes in the windows?” = air conditioners. “The water coming from the sky is definitely making me wet.” = rain. “Was King Kong really right here?” = no…that was a doll (the little boy seemed rather disappointed.). “Is that Canada?” = no, it’s New Jersey. “Will it snow today, please?” = no, it’s too warm. We may laugh at some of these comments but they are terribly endearing. To have had the privilege to spend time with such innocent, polite and loving children made the tour such a joy. All the sights excited them, I think the big ‘hits’ were the Liberty Statue and the wax museum. They were fascinated that are streets are filled with such diversity “in our country – everyone looks the same.” But above all that, they had only one consuming desire and that is – to shop! (Head phones seemed to be atop most of their lists.) So Best Buy was their main goal. Their next stop is on to Washington, D.C., and then on to Disney World. Not bad, huh? It was hard to say goodbye to them, but same time next year, I’ll have some little boy tug on my sleeve and say “Sir . . . how far is Best Buy from here…?” I look forward to that already. THE GREEK EARTH MOTHER ~ MELINA MERCOURI: In honor of Greek Independence Day yesterday Καλημέρα CALIMERA! For those of you too young to know who Melina Mercouri was, below is the Random House dictionary definition of ‘earth mother’ = that would befit Melina. n. 1. the earth conceived of as the female principle of fertility and the source of all life. 2. a female spirit or deity serving as a symbol of life or fertility. 3. a sensuous, maternal woman. In 1960 Melina Mercouri had become an international sensation. Her Greek film classic ”Never On Sunday” was a tremendous world wide success. The lp record of the musical score by Manos Hadjidakos played constantly in our house – I was raised on it and it played in every public establishment you went, there was a craze for everything Greek. “Never On Sunday” became the single most successful foreign film at the time. Melina played ‘Ilya’ a feisty Greek streetwalker with a heart of gold. Not until 1970 was I even allowed to see the film because for those times it was considered to risqué for television and mom wouldn’t allow me to see it in the movies. I was captivated. I had never seen such an earthy woman. The confidence, the walk, the mannerisms and above all – that voice! “Never On Sunday” is based on ‘Pygmalion’ by George Bernard Shaw later to become “My Fair Lady” starring Audrey Hepburn – the streetwalker then changed to the more befitting flower girl for American tastes. In person Melina’s voice was smokey and gravely (mostly by nature but also partially due to her chain smoking). Her tossed blonde hair was like a mane. She moved like a sensual tribal dancer. Her laugh was absolutely unmistakable – uproarious, uncontrolled, deeply from the gut. Endless enthusiasm, filled with a passion for the arts and life. A fiercely independent Greek destined to become Greece’s member of parliament in 1977 and Greece’s first Minister of Culture in 1981! On Saturday, October 21, 1972 we met. My mother Ursula worked at the time for Clifford Day Mallory of Mystic Seaport, Connecticut. The Mallory family happened to have founded Mystic, Connecticut. Mom was personal assistant to Mr. Mallory who was in the shipping brokerage business, which means, they brokered empty cargo ships to the highest oil company bidder for them to be used to transport their oil to the port of choice. Mr. Mallory had a business deal with Jules Dassin while Melina was in town for her failed musical version of “Lysistrata” . . . so all our lives converged. This divine earth mother had come to Broadway in the Greek comedic play ‘Lysistrata’ by Aristophanes written in 411BC! It ironically deals with the story in which the women of Greece withhold sexual favors from the men until they men agree to stop going to war. A sexual political farce. Melina was born to play the part. 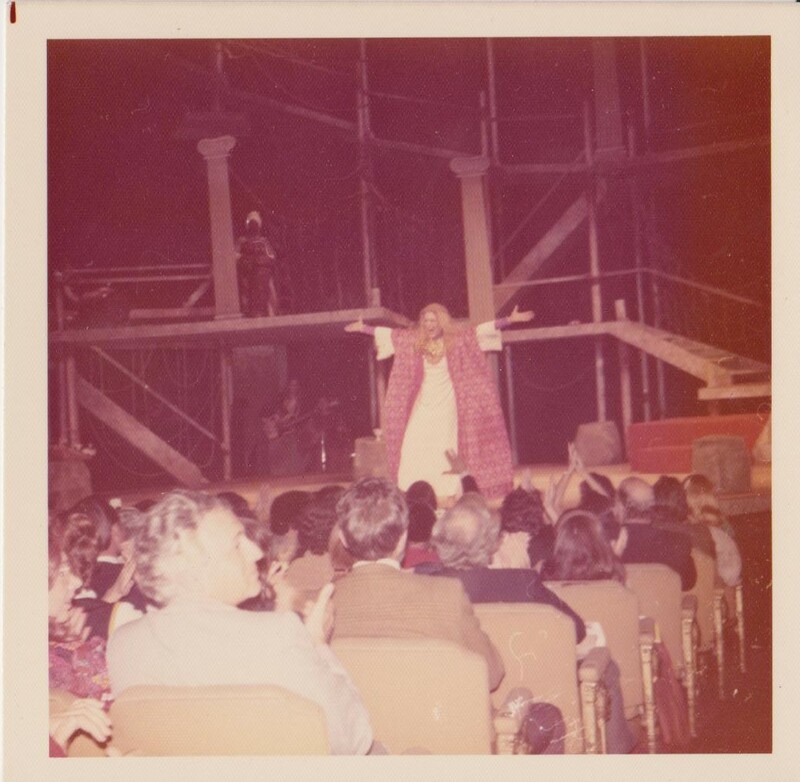 The show previewed on October 20, 1972 – the night the above seated dressing room photo was taken. My first and ever lasting impression of her was how she pronounced my name. ‘Hrchrchanzz’. Being Greek, she could not say a soft letter “H”, but out came this throaty ‘Hrchrchanzz’. A hard “H” purred from her lips. 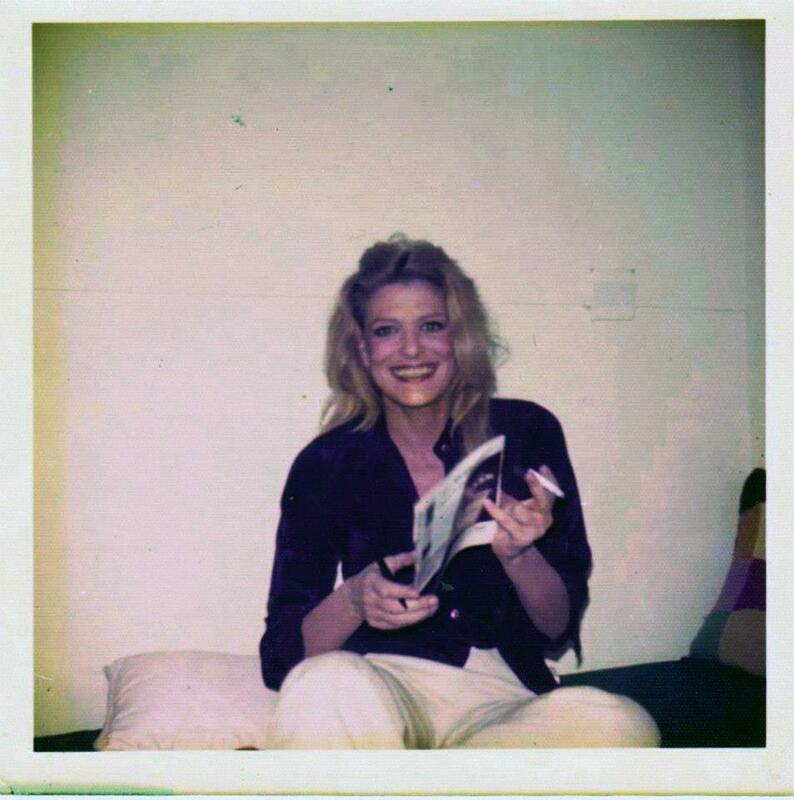 Sitting there in her dressing room in her off white cashmere pants (she loved cashmere) and her deep purple silken blouse, blowing billows of cigarette smoke into the air. ”Lysistrata’ played 35 previews until it’s opening night we attended on November 13, 1972. The show was for 1972, too ahead of it’s time and the reviews (many based on personal vengeance) were very unfavorable based on Melina’s political views against the military coup of her country. Shockingly it closed after only 8 performances/one week. Closing night was October 18, 1972. Melina took the news philosophically. “Po po po! I can’t be sad, I was born Greek and will die Greek, this is telling me I am meant to concentrate even more to fight for my country.” She continued on in the United States to publicize her 1971 book “I Was Born Greek”. Melina was staying at the hotel Nevaro on Central Park South in the penthouse suite. While Melina’s husband Jules conducted business with mom’s boss Mr. Mallory, mom and I were sent to keep Melina company. Melina had loved the photo I had taken of her the night we met, “Po po po! It is so soft, yes?” Melina’s ‘yes’ meant ‘isn’t that so?’ The ‘softness’ comes across because she was so happy and had such belief in her new Broadway show. To please Melina and to take her mind off the show I had the photo made into a poster (black and white was all I could afford) and presented it to her in her hotel suite. “Hrchrchanzz! I think you do this to make me happy, yes?” Yes I did. Melina signed my copy of the poster which has been framed on my wall for the past 41 years. Sometime in the 1980’s I heard from some fans of hers complimenting me on the photo. It turns out Melina had used the photo in a Greek publication of her biography – I had been published! Sadly I have never found a copy of the book or the literature. Every time I pass that vibrant proud Greek earth mother’s photo on my wall- I still feel her embrace and hear that uproarious laughter “Ah Hrchrchanzz!” She was and always will be Greece! (Greek: ΜελίναΜερκούρη), born as Maria Amalia Mercouri (18 October 1920 – 6 March 1994) was a Greek actress, singer and politician. As an actress she made her film debut in Stella (1955) and met international success with her performances in Never on Sunday, Phaedra, Topkapi and Promise at Dawn. She won the award for Best Actress at the 1960 Cannes Film Festival, and she was also nominated for an Academy Award, three Golden Globe Awards, and two BAFTA Awards. A political activist during the Greek military junta of 1967–1974, she became a member of the Hellenic Parliament in 1977 and the first female Minister for Culture of Greece in 1981. Mercouri was the person who, in 1983, conceived and proposed the programme of the European Capital of Culture, which has been established by the European Union since 1985. She was a strong advocate for the return to Athens of the Parthenon Marbles, which were removed from the Parthenon, and are now displayed in the British Museum. TASTY TULIPS: While wandering through the 14th Street farmers market in Union Square Saturday early morning, it was the early morning’s sunlight as it illuminates the flowers that always catches your eyes. As I was busy looking through the lens photographing some displays of tulips on a table, I heard this voracious munching and slobbering sound at my feet. 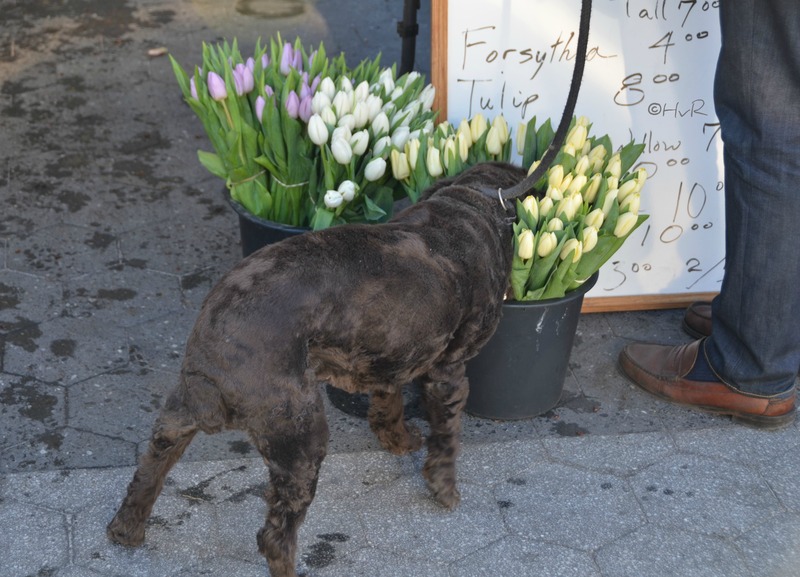 There was Frida, this loveable chocolate colored dog who evidently thought that tulips are just about the tastiest things for breakfast…burp. 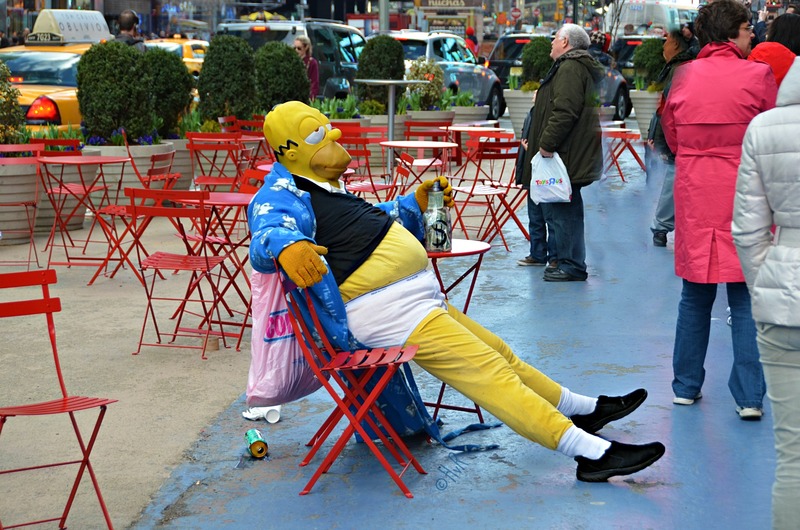 Photo of the day: HOMER SIMPSON ~ BURP ! BURP: Time to lay back . . it’s the weekend . . . burp.